Lado Pochkhua was born in Sokhumi, Georgia in 1970. He graduated from the Sokhumi College of Art in 1994 and the Tbilisi Academy of Art in 2001. 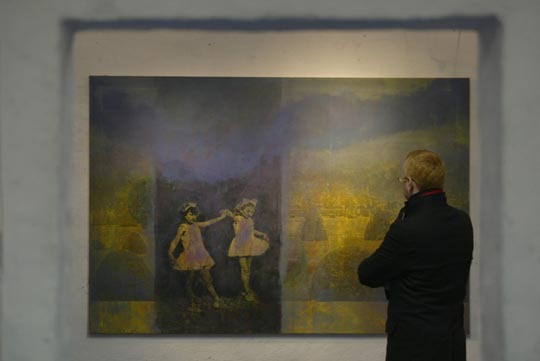 He has had personal exhibitions in TMS Gallery and Old Gallery in Tbilisi, and has participated in ten major group exhibitions, including in the Georgian Embassy in London, UNESCO in Paris, and in the Tbilisi History Museum (Carvasla) and the National Gallery of Art. He has participated in international projects in Russia and Azerbaijan, and has lived and worked in Georgia, Russia, Azerbaijan, the United States, and Hungary, where he currently resides. “Orientalism: Inside and Outside” Biennale contemporary artists of Azerbaijan, Georgia, Iran, Turkey, Turkmenistan, and Uzbekistan. Exhibited large prize-winning 3- and 2-dimensional works in photography, glass, and other media. Lado Pochkhua 1970-ben született Sokhumiban, Grúziában. 1994-ben végzett a Sokhumi Művészeti Iskolában, 2001-ben pedig a Tbilisi Művészeti Egyetemen. Egyéni kiállításai a TMS Galériában és Régi Galériában Tbiliszi-ben voltak és részt vett tíz nagyobb csoportos kiállításon, beleértve a Londoni Grúz nagykövetséget, a párizsi UNESCO székházat és a Tbiliszi Történeti Múzeumot (Carvasla), illetve a Nemzeti Galériát. Oroszországban és Azerbajdzsánban részt vett nemzetközi projektekben, élt és dolgozott Grúziában, Oroszországban, Azerbajdzsánban, az USA-ban és Magyarországon, ahol jelenleg is él. You do not often hear an artist admitting that the title he or she has chosen for an exhibition sounds pretentious, but that’s exactly how Georgian artist Lado Pochkhua describes the title of his latest show The Anatomy of Melancholia. Such frankness is refreshing in an art world were pretentiousness often rules the roost, and Pochkhua’s art itself is just as refreshing as his approach. Pochkhua, 38, is an energetic figure and his enthusiasm for his field is clear. 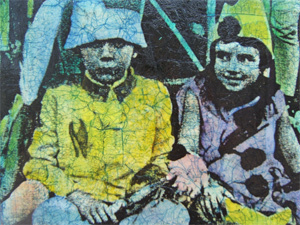 Much of his work is based on old photographs that he picks up in the flea markets of Budapest. He then either draws the images in pen and ink or transfers them onto canvas using acrylic medium. This is just the beginning, though. 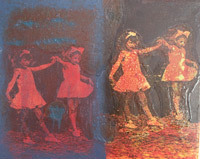 After that Pochkhua, who studied at the Tbilisi Academy of Art and has exhibited in US, Sweden and Georgia as well as Hungary, takes the simple image and transforms it into what he calls a “memoryscape”. At the moment many of the images Pochkhua unearths are from the 1930s. You can feel the past in his paintings, which build images of people playing tennis, youngsters at school, or gentlemen in old bathing suits into a landscape of muted colours. While most of the time Pochkhua feels that the people in the pictures are not as important as the impression the work gives the viewer, he also occasionally unearths an image that captures as specific moment in history. And as for the “pretentious” title of the exhibition, Pochkhua took it from the title of 17th century book by Robert Barton, in which the author attempts to classify and cure all different types of melancholia. Pochkhua began reading the book when he went through an initially tough time upon arriving in a dark, unwelcoming and “melancholy” Budapest in November 2006. Barton admitted he studied melancholia in an effort to keep busy and therefore avoid his own melancholia. The Georgian artist adopted this approach in Budapest, and has become prolific. 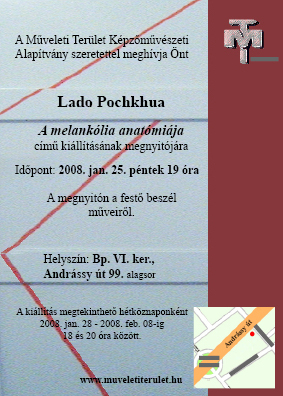 With no shortage of flea markets in Budapest, you can be sure that Pochkhua won’t run out of inspiration.